It has been sixteen months since my last essay and figured this weekend, just before the April Federal Reserve meeting, that the time is ripe to make an appearance especially with gold sector sentiment so bleak and dreary. "Stacking Season" is here and the best time to stack is when nobody's paying attention. Now, some of you might think it premature to be writing of gold and silver price targets of $2700 and $67 when neither metal has made a run toward the former highs and when famous technician-trader types on CNBC have proclaimed the end of the Bull Market in gold. The end of the Bull Market in gold? Is that what they're saying? Bull markets don't typically end this way. Besides, they're not paying attention to the appropriate moving average relationships for gold. Back in 2008, I wrote an essay on Gold-Eagle.com about when to buy gold. So, let's return to that technical data and apply it to the present situation. Back in 2008 the Great Financial Crash took gold right thru 65 week exponential moving average support down into the 200 week EMA, where gold found support and recovered from. So, I see that as long term "meltdown" support. At this time, I don't see that occurring in the near future and think that gold will continue to consolidate for a few more months above its 65 week exponential moving average. Each time that gold visits its 65 week EMA it's stacking time, in my opinion. Examining the technical indicators, there doesn't appear to be anything of grave concern here for gold. The stochastic indicator is approaching its support area where it likes to turn back upward from. Although the MACD indicator is still falling, there's a positive divergence on the histogram. As for price, it's likely that gold will consolidate for a while longer below $1800 with perhaps more 65 week EMA testing this summer before gold can rise above the resistance at $1800 and make a run to the old high. From there it may consolidate again to test $1800 as a new floor before rising up thru $1900 this year or next. The 2008 leg took gold from just under $700 to just over $1900. That is an A to B leg of around $1200. Gold's D Decline took it off the high down into the 1500's. From the December 2011 low we can add the $1200 A to B leg and we get a price projection of $2700. Stack when it's time to stack. But what of silver? Indeed. Silver is digesting the 2011 parabola and it may be quite a while before it challenges $50. Over the next two years I can see silver reaching $67. Take the high near $50 and subtract the 2008 low near $9 and add that to the December low near $26 and the price projection is $67. As for support, trend line support crosses $28 which lies above the December low so even if silver pulls back further, as long as silver holds above the December 2011 low the price projection is valid. Corrections after parabolic rises are usually violent, as you can see. 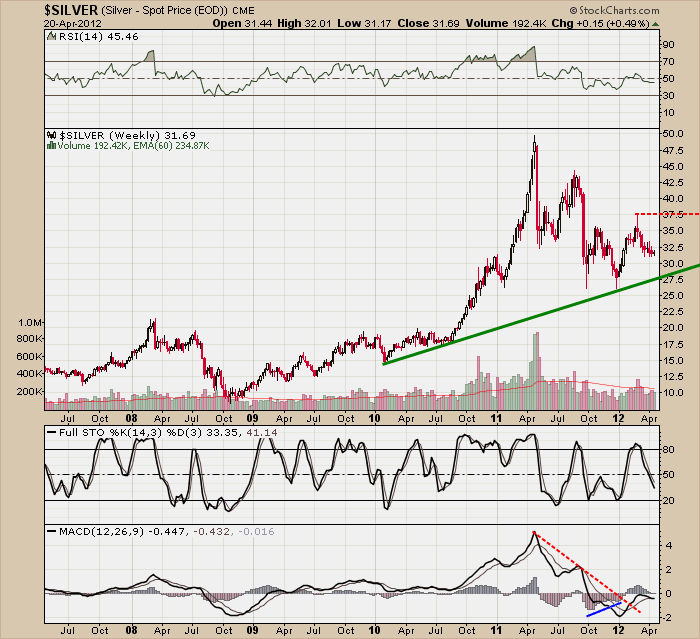 Silver corrected a bit less than 62%, which is a normal correction following a parabolic rise like that. When the charts say it time to stack, well then it's time to consider stacking! But what about gold and silver stocks? Now you're really bringing up a messy subject. Gold stocks have been underperforming gold for quite a while for a number of different reasons. Energy costs have increased along with the metal (priced in fiat currency) and that affects margins. In addition, there's political risk (nationalization; regulation). 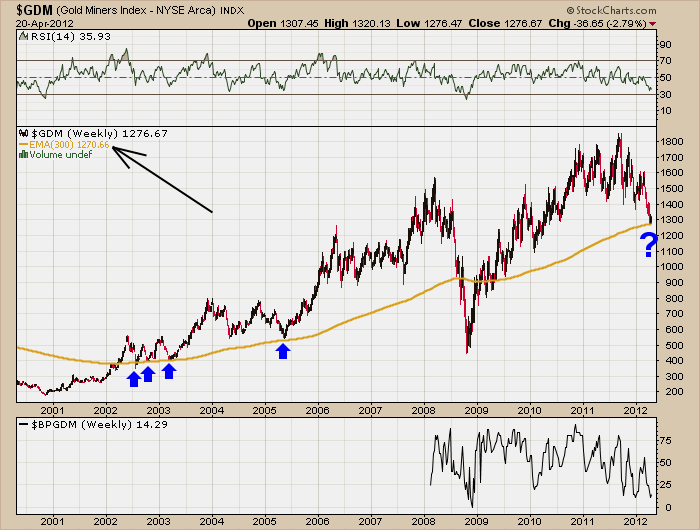 So, I was looking for a way to determine where support would make sense and found that, other than during the 2008 Great Financial Crash, the Gold Miners Index has found support along its 300 week exponential moving average. It can spend a number of weeks testing it from time to time and occasionally piercing it by ten percent. 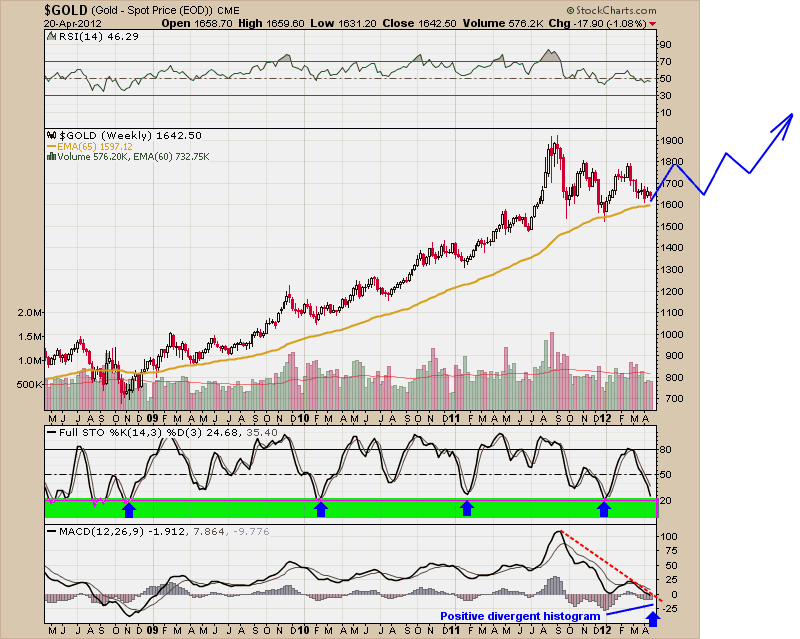 So, the chart you see above includes the 300 week EMA, relative strength and the Gold Miners Bullish Percent indicators. The Gold Miners Bullish Percent indicator is the most oversold that it has been since 2008 and last week began to make a turn back upward. With the 300 week EMA at 1270, I see the downside risk of the index to be another ten percent from here. On a more bullish note, there's a chance it could be bottoming out right in here. 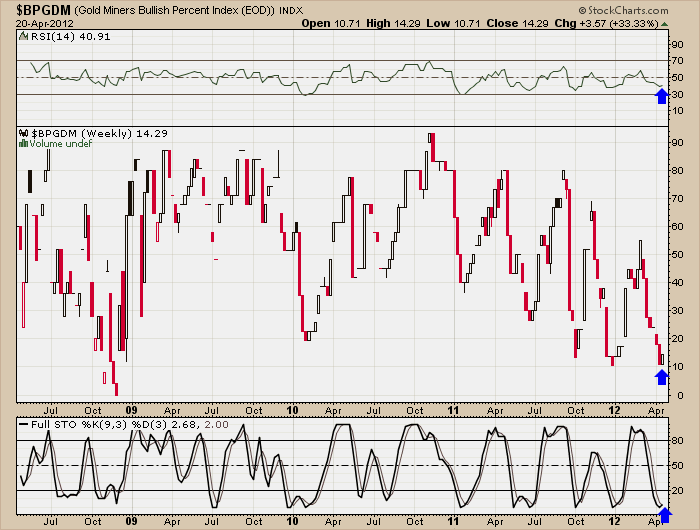 So, let's next examine the bullish percent indicator weekly chart. It's a bit nerve wracking to be publishing in front of a Federal Reserve meeting, but I'll give it my best shot. As you can see, the indicator is nearly as oversold as it became during the Great Financial Crash of 2008. Last week saw slight rises in relative strength, "price" and stochastic indicators. So, the evidence suggests that gold stocks are trying like crazy to carve out lows right here. So, what about the silver stocks? 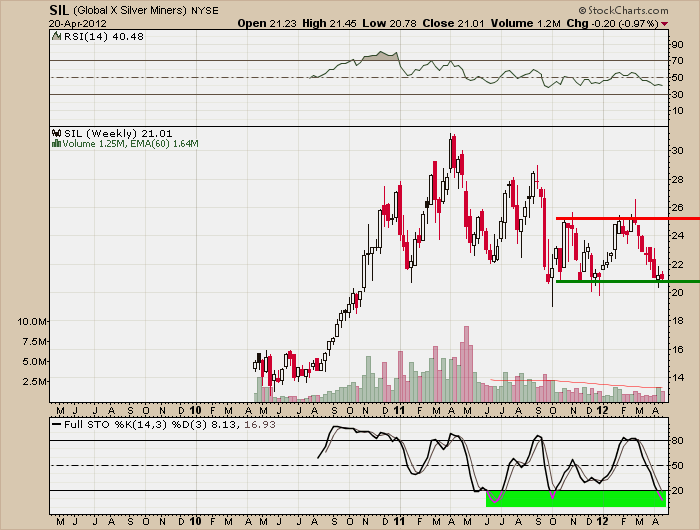 Well, the silver stocks have been moving sideways in a channel the past six months so they're stronger than the gold and silver miners taken together. This ETF isn't spectacularly liquid, but for smaller positions it shouldn't be too difficult to exit. Last week it averaged 240,000 shares traded daily. There's a solid $4 swing opportunity inside that price channel should it continue. The stochastic indicator in that weekly chart has yet to cross back up and over 20, but it is well inside the oversold zone and a turn back upward may not be long off. Although there are no guarantees that the metals and the shares can bottom out here, there's sufficient technical evidence that it is a worthy time to do so. We'll see what the markets decide. As for gold reaching $2700 and silver $67, that's not until sometime during 2013 at the earliest. Everyone's personal situation is different and technical analysis never guarantees outcomes. Playing in gold and silver fields is risky, so you should really consult your own expert on topics like this. Don't swing a bat blindly. This essay is intended as an observation and for entertainment, so you really need to do your own work and then determine your best investment strategy with your own registered investment adviser.